Writer Mike Bartlett delivers a raw, creepy and devastatingly emotional story which sees the Landlord feeding people to what The Doctor calls the 'Dyrads' (wood lice insects that work on a cellular level), becoming a part of the house itself. This element instills the fear that makes this episode more horror based. The inclusion of the binaural sound adds a richness to the creaks and other spooky sounds, highlighting the importance of sound and its effects. Bill's potential housemates don't provide enough depth to make them feel like fully realised characters. This may be because of the duration of the episode. There is simply not enough time to invest into their characters. 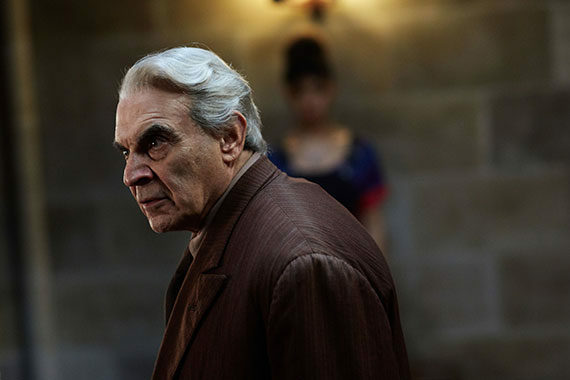 David Suchet's charming and sinister performance is undoubtedly mesmerising and emotionally powerful. The change from sinister wise man to a child who's afraid of losing his mother provides a charming and harrowing performance. His character explores the idea of a child who was too afraid to leave his childhood behind, causing him to make terrible decisions. The concluding moments where the wooden lady turns out to be the Landlord's mother, not a daughter, is a sorrowful and harrowing plot twist, as she realises what her son has done to keep her alive. The plight of the Landlord's pain and ignorance was fascinating and makes him one of the more deeply interesting antagonists of the series. Knock Knock was a spooky mystery horror house episode with classic scares and a beautiful flourish to the antagonist's story.